I posted yesterday about Occupy 2.0 and how Bishop George E Packard was arrested after climbing over a fence to get to Duarte Square. 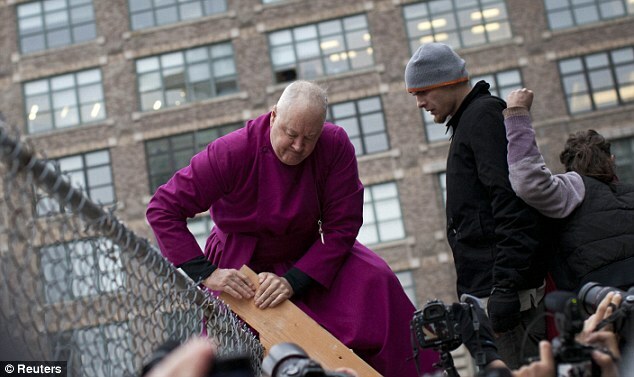 I have to give credit to the Bishop for standing up for the OWS movement like he has been doing. However, my curiosity was peaked…. Why did OWS specifically choose this lot in an attempt to occupy? It is private property and owned by Trinity Church, who has told the group that the did not want OWS to occupy their park. So off to google search I go to find my answer…. Trinity Church is one of the city’s largest landowners and strongly tethered to the 1 percent: Five of the 20 members of its vestry, or church parliament, for example, hail from high-ranking roles at financial firms such as Citigroup and Merrill Lynch, and others come from the insurance behemoth AIG, a market research firm for energy investors, and even Brookfield. The church’s two wardens, the men directly below the rector who are responsible for its assets, run an investment bank and group of mutual funds. I see now. The motive behind the attempt to occupy this park makes more sense now. But…. (gotta love those “but’s”), as much animosity that I have for those who are corrupt, and I’m pretty sure this church is as this is the norm these days (and the quote above from Mother Jones just reeks of “immoral” management of monies), and also belonging to the 1%, the park is private property and the church said “no” to the occupiers. They have that right to do so. I wouldn’t be happy if a large group of people moved onto my property without my permission. Simply because they are part of the corrupt 1% (and I prefer to specify “corrupt 1%” because there are those who have fared very well in life without corruption) does not make them exempt from this right. No one said this movement was going to be easy. There will always be obstacles to hurdle, and each bridge will be crossed as one comes to it. Many Occupy camps are now moving indoors for the winter, both due to being kicked out by the police and city, and also because, well… it’s winter. I think this is a great idea! Here in Albuquerque we have moved inside as well. Of course, our group is much smaller than the OWS group, but we are able to accomplish a lot more. My health has taken me away from participating much now, but the group is organizing to help those people who are being evicted from their homes due to foreclosure. Now, here is the full statement from Reverend Dr. James H. Cooper, Rector of Trinity Church, in response to today’s Occupy Wall Street protests. OWS protestors call out for social and economic justice; Trinity has been supporting these goals for more than 300 years. The protestors say they want to improve housing and economic development; Trinity is actively engaged in such efforts in the poorest neighborhoods in New York City and indeed around the world. We do not, however, believe that erecting a tent city at Duarte Square enhances their mission or ours. The vacant lot has no facilities to sustain a winter encampment. In good conscience and faith, we strongly believe to do so would be wrong, unsafe, unhealthy, and potentially injurious. We will continue to provide places of refuge and the responsible use of our facilities in the Wall Street area. We are gratified by the support we have received from so many in the community. Agreed. The church should help out and allow the Occupiers to stay – that is the foundation of what churches are built upon. However, this church is the epitome of hypocrisy and corruption, so this will never happen. If the church says “no” that is their right. So OWS should refocus their attention and move onwards and upwards. This is very sad.